Exporter of a wide range of products which include marble table base. 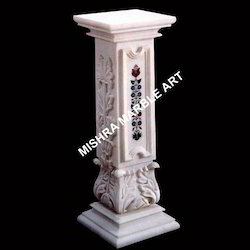 Our organization holds expertise in offering an exclusive range of marble table base to our clients. These are manufactured using best grade marble, sourced from certified vendors in the market. Our clients can avail our range in the form of a pillar with a sturdy construct. Furthermore, we provide customized solution to our clients as per their requirement. Looking for Marble Table Base ?